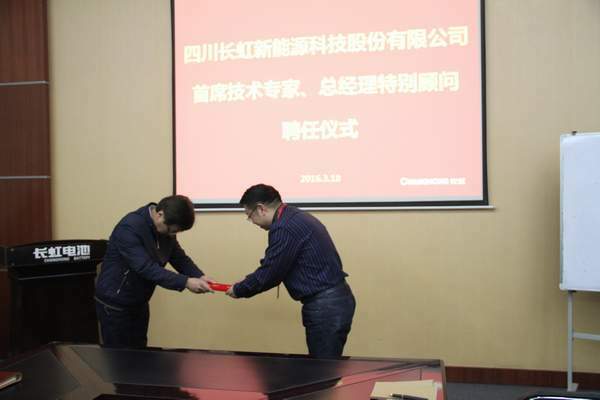 March 18, 2016 in the afternoon, Japanese sophisticated experts Mr. Qiantian obtained employed ceremony in Changhong NewEnergy Company. The general manager issued the letter of appointment, and the ceremony contained company’s middle level & above cadres and part of the core backbones. Changhong NewEnergy Company devoted to be a top international battery manufacturer. Retired Mr. Qiantian is an advanced battery technique expert with many years’ experience in famous international enterprise. The company hired Mr. Qiantian as chief technical expert, president’s special advisor. He will be responsible for introducing Japan's advanced battery quality and management experience under the direct leadership of the general manager, improving company 5S management，complete quality control technology, increase company's technical team ability level, and provide strong supports for company’s high-end customers and markets. Changhong NewEnergy Company is the top 3 battery enterprise of China and is going to log in the Three Board. The league of sophisticated experts makes the company like a tiger with wings and steps closer to the international top battery enterprise.